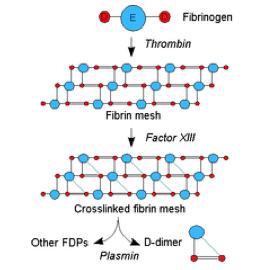 Since 2 to 3% of plasma fibrinogen is physiologically converted to crosslinked fibrin and then degraded, a small quantity of D-Dimer is normally present in the plasma of healthy individuals. D-Dimer has a plasma half-life of approximately 8 hours and clearance primarily occurs by the kidneys and reticuloendothelial system. Continued fibrinolysis that occurs in DVT and PE causes the D-Dimer to remain elevated for about 7 days after the event. The production of specific antibodies to the unique neo-epitope of D-Dimer permitted the development of immunoassays to quantitate D-Dimer. Today, D-Dimer can be measured in approximately 30 minutes on coagulation or chemistry analyzers using latex agglutination turbidimetric detection. Reportable units vary by manufacturer. Assays that use purified D-dimer as the calibrator report results in D-Dimer units (DDU), while assays that use plasmin proteolysis products of fibrin clots report their results in fibrinogen-equivalent units (FEU). The mass of one unit of FEU is approximately twice the mass of one unit of DDU. Therefore, DDU can be converted to FEU by multiplying D-Dimer concentration by 2. For example, 250 ng/mL DDU is equivalent to 500 ng/mL FEU. Currently, there is no established reference method, primary standard or universal calibrator for D-Dimer assays. Most of the clinical guidelines have been based on D-Dimer assays reporting in FEU and use 500 ng/mL as the clinical cutoff. D-Dimer results are most commonly used in the evaluation and exclusion of deep vein thrombosis (DVT) and pulmonary embolism (PE). Many studies have indicated that the combination of pretest clinical probability assessment and D-Dimer testing is a safe and effective model for excluding DVT and reducing the number of more expensive imaging studies. In hemodynamically stable patients, the diagnosis of PE should follow a sequential diagnostic workup consisting of clinical pretest probability assessment, D-Dimer testing and, if necessary, computed tomography pulmonary angiography. For patients in whom the risk of PE is thought to be low, a normal D-dimer (<500 ng/mL [fibrinogen equivalent units]) effectively excludes PE, and typically no further testing is required. This includes patients who have had a prior PE and those with a delayed presentation. In contrast, an elevated D-dimer (>500 ng/mL [fibrinogen equivalent units]) should prompt further testing with diagnostic imaging. For most patients in whom PE is thought to be intermediate, a normal D-dimer (<500 ng/mL (FEU) also effectively excludes PE, and typically no further testing is required. However, some experts believe that a subset of patients in the intermediate risk category with a Wells score 4 to 6 should undergo CT angiogram based upon the higher probability of PE in these patients. Patients with a high pretest probability should immediately undergo a confirmatory CT angiogram. While a negative D-dimer result reduces the likelihood of PE in this population, it does not completely rule out the diagnosis, because as many as 5% of these patients will have a PE. D-dimer levels rise with age such that using the traditional cutoff value of <500 ng/mL (FEU) results in reduced specificity of D-dimer testing in patients older than 50 years. Adjusted D-dimer levels based on age have been proposed. The most commonly used formula for age adjustment is: age (if over 50) * 10 = cutoff. Recent evidence supports the use of clinical pretest probability and age-adjusted cutoffs to improve the performance of D-dimer testing in patients greater than 50 years of age. Compared to a fixed D-dimer cutoff, age adjusted D-dimer cutoff values result in equivalent outcomes and no additional false negative findings. D-Dimer is sensitive for detecting proximal, but not distal DVT’s. Distal DVT may have such a small clot burden, that D-Dimer levels remain below the threshold of detection. A negative result does exclude the possibility of a distal DVT. D-Dimer is generally not useful in workup of upper extremity DVT since other risk factors such as central venous catheters and pacemakers cause false positive D-dimer results. Most studies have included only patients with recent (<7 days) symptoms of venous thromboembolism. D-Dimer may be less effective in excluding DVT or PE of longer duration. False negative results may occur. Clinical pretest probability of DVT must be taken into account when evaluating test results. All D-dimer assays have relatively low specificity for diagnosis of venous thromboembolism. A negative result is useful in ruling out venous thromboembolism, but a positive result is less helpful in confirming the diagnosis. D-Dimer is useful in excluding the diagnosis of DVT and PE because a highly sensitive quantitative assay has a negative predictive value (NPV) of nearly 100%. The trade-off for this high sensitivity is relatively low specificity of 40 to 60 percent. D-dimer results are often falsely positive, and the proportion of false positive results increases with any acute or inflammatory process. Examples of conditions with elevated D-dimer levels include; age >50 years, recent surgery, trauma, critical illness, second and third trimester of pregnancy or postpartum state, rheumatologic disease, advanced liver disease, renal dysfunction, disseminated intravascular coagulation and sickle cell disease. Because of this lack of specificity, D-Dimer testing should not be ordered on most hospitalized inpatients when DVT or PE is suspected. Some studies suggest that D-dimer levels measured after discontinuation of oral anticoagulant therapy (OAT) may be useful for predicting the likelihood of recurrent VTE (Thromb Haemost 2002; 87:7-12 and Circulation 2003; 108:313-318). One management strategy is to stop anticoagulation in patients with unprovoked VTE after 3 months and measure D-dimer 1 month after cessation of anticoagulation. An elevated D-dimer level is an indication to restart anticoagulation, while a normal result along with the absence of other risk factors for recurrence provides support for discontinuing anticoagulation (Marshall AL, et al. JCOM 2015;22:222-240). D-dimer cutoffs of 250 or 500 ng/mL have been used for this purpose. Normal plasma levels of D-dimer by ELISA testing are <500 ng/mL for fibrin equivalent units (FEU) or <250 ng/mL for D-dimer units (DDU). Specimen requirement is one 5mL citrate (blue top) tube. Stein PD, Hull RD, Patel KC, et al. D-dimer for the exclusion of acute venous thrombosis and pulmonary embolism: a systematic review. Ann Intern Med 2004; 140:589. Crawford F, Andras A, Welch K, et al. D-dimer test for excluding the diagnosis of pulmonary embolism. Cochrane Database Syst Rev 2016; :CD010864. Kearon C, Ginsberg JS, Douketis J, et al. An evaluation of D-dimer in the diagnosis of pulmonary embolism: a randomized trial. Ann Intern Med 2006; 144:812. Righini M, Van Es J, Den Exter PL, et al. Age-adjusted D-dimer cutoff levels to rule out pulmonary embolism: the ADJUST-PE study. JAMA 2014; 311:1117. Raja AS, Greenberg JO, Qaseem A, et al. Evaluation of Patients With Suspected Acute Pulmonary Embolism: Best Practice Advice From the Clinical Guidelines Committee of the American College of Physicians. Ann Intern Med 2015; 163:701. Woller SC, Stevens SM, Adams DM, et al. Assessment of the safety and efficiency of using an age-adjusted D-dimer threshold to exclude suspected pulmonary embolism. Chest 2014; 146:1444. Douma RA, le Gal G, Söhne M, et al. Potential of an age adjusted D-dimer cut-off value to improve the exclusion of pulmonary embolism in older patients: a retrospective analysis of three large cohorts. BMJ 2010; 340:c1475. Sharp AL, Vinson DR, Alamshaw F, et al. An Age-Adjusted D-dimer Threshold for Emergency Department Patients With Suspected Pulmonary Embolus: Accuracy and Clinical Implications. Ann Emerg Med 2016; 67:249. Fuchs E, Asakly S, Karban A, Tzoran I. Age-Adjusted Cutoff D-Dimer Level to Rule Out Acute Pulmonary Embolism: A Validation Cohort Study. Am J Med 2016; 129:872.
van Es N, van der Hulle T, van Es J, et al. Wells Rule and d-Dimer Testing to Rule Out Pulmonary Embolism: A Systematic Review and Individual-Patient Data Meta-analysis. Ann Intern Med 2016; 165:253.